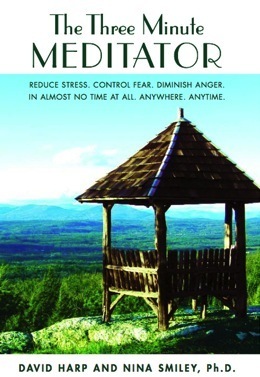 Now available: The Completely Revised Fifth Edition of The Three Minute Meditator! 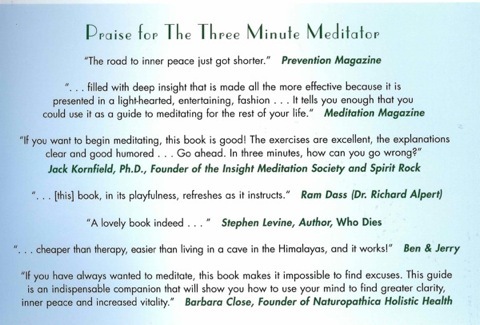 The Three Minute Meditator is co-written by David Harp, M.A. and Nina Smiley, Ph. D. This 256 page book will almost immediately provide you with the mental tools you need to begin a mindfulness practice, right away. No jargon, no dogma, just a simple step-by-step program that has been refined by experimentation with tens of thousands of satisfied customers. For more information about The Three Minute Meditator, and its companion CD Mini-Meditations that will Enhance Your Life, or about David and Nina, please visit this website! Click here to view or edit your shopping cart!